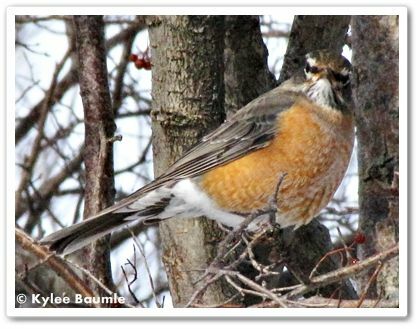 Robins that spend summers in Canada may travel southward when cold winter weather arrives, and to them, the northern United States is south. So some of the robins we see may be Canadian robins. But many of our native robins hang around, as long as they have a reliable food source. Most winters, I will see robins on a regular basis, this winter included. 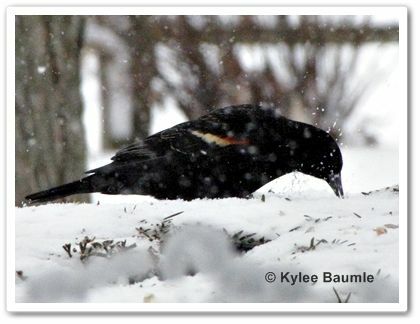 But one bird we don't see much of when the weather turns cold is the red-winged blackbird. We are in the northern part of their year-round range, but you're not likely to see them here until spring is approaching. I saw my first one of the season last Saturday, as I drove to nearby Ft. Wayne, IN. The flash of red and yellow on their wings is an attention-getter when the landscape is covered in snow and there isn't much color along the roadside. That's where they can usually be found, in both winter and summer - perched atop tall plants in ditches or higher up on power lines. They prefer marshy wetlands and like to make their nests near such areas. And then they showed up here during the snow storm on Monday afternoon, after I'd already submitted my Great Backyard Bird Count report. The male red-winged blackbirds are real Casanovas. They patrol and defend their territory and may take as many as 15 mates at a time, making up their harem. Females have 2-3 broods a year, with 2-4 eggs in each one. It only takes 11-13 days for the eggs to hatch and another two weeks until they fledge. Blackbirds generally forage on the ground rather than visit a feeder, so to attract them to your yard, scatter seed on the ground. The blackbirds you see here are eating from the top of some yew shrubs, just under our platform feeder, from which other birds have thrown seed as they feed. 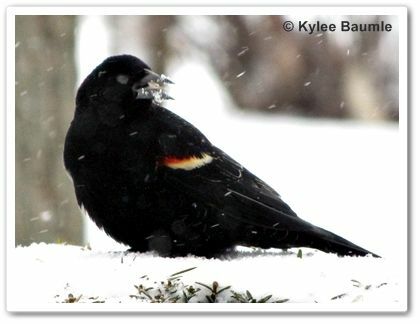 When looking for the red-winged blackbird, be sure to listen for their distinctive song. They're announcing the approach of spring, you know! Thanks for the tip. We see a lot of robins here. They must be winter loving birds. we will sometimes see robins early but I like you wait for the red-winged blackbirds...then I know spring is really here..haven't seen either yet..too much snow on the ground here still and more on the way..
WE have robins all winter...I watch the geese. The Redwings are already claiming territories here. Robins aren't a sign of spring here in Austin either, Kylee. They're a sign of autumn for us! 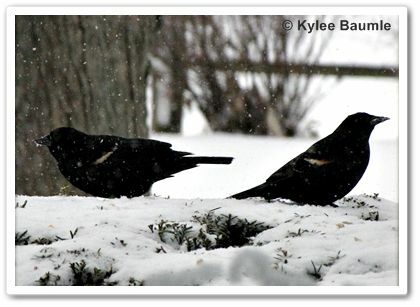 I haven't seen any red-winged blackbirds yet, but I did hear them last weekend - yay! These flock in with the Brown Headed Cowbirds by the hundreds here. And yes they do empty our bird feeders and eat suet out of the hanger. I watch for them here, too. We had such beautiful weather in Jan & early Feb that I found myself watching for them a little early. I don't see them in my yard, but they love the marshy area down the road. Finally saw the first arrivals recently. Spring must be here! Robins don't overwinter much here outside Chicago. But I've seen some already. Still waiting on the RWBB, a true harbinger.